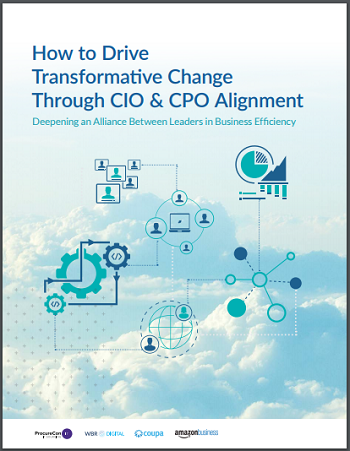 Changes in IT spending and the role of procurement call for a new alliance between the twin engines of business efficiency: Chief Information Officers (CIOs) and Chief Procurement Officers (CPOs). Gone are the days of IT operating in its own sphere and procurement fulfilling a purely tactical function. With the rise of cloud technology and procurement’s new strategic role, IT spend has grown into a procurement issue—which means leaders need to work together to optimize value. A strong partnership with strategic focus is key in shaping a digital transformation strategy and driving better business efficiency across your entire organization.